It was another beautiful morning at the campground. We, of course, started the day with a 3.5 mile exercise walk. It was cooler when we started this morning but by the time we returned to Fred about 55 minutes later, it was hot. 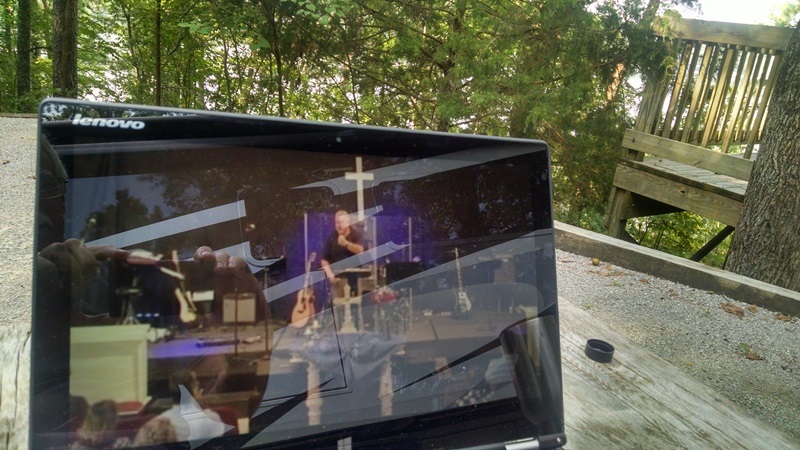 We were back at Fred in time to grab the computer and watch the live stream of our church service at Lester Memorial. It was another very good service with the youth that are headed off to college this week helping with the praise band today. It was also sort of cool to sit outside looking at the river and watching the service. Wouldn’t want to to that every week but it was fun today. We were looking forward to the resumption of river traffic tonight at 6:00 pm and returned from our afternoon walk just in time to watch. There was noise and some action. They removed a crane today and moved another. At 6:00 a Corp tug pulled into place behind one of the work barges beside the lock. After about 30 minutes of sitting there, the tug backed off and moved over like he was going into the lock and pulled up behind another work barge. And that’s where the action stopped. It’s now 8:48 pm and they have all the lights on at the lock lighting up the world and nothing has moved. Can’t find a navigation bulletin from the Corp indicating another delay but there’s no traffic tonight. New activity at the dam but we didn’t see anything lock through today. The campground is really quiet tonight. All the weekenders have left and we have the bottom loop by the water to ourselves. Better be careful, you might get used to the easy life!